Potato Chips are always something that sound good to me in theory, but the moment I pop one into my mouth I am reminded that I really don’t much care for them. Isn’t that how a lot of cravings are? You crave pickles for their crispness and they just aren’t crunchy enough. You crave chocolate for their “velvety-ness” and they aren’t velvety enough. You crave a chick-flick and you didn’t cry hard enough. Ahem, *cough cough* who’s talking about chick-flicks?! But, really potato chips aren’t what they are cracked up to be, in my taste anyway. They are too heavy and rich and I can only eat about five and then I’m done, give me something else. My dad was raving about kale chips that one of his buddies at work was chowing down on. 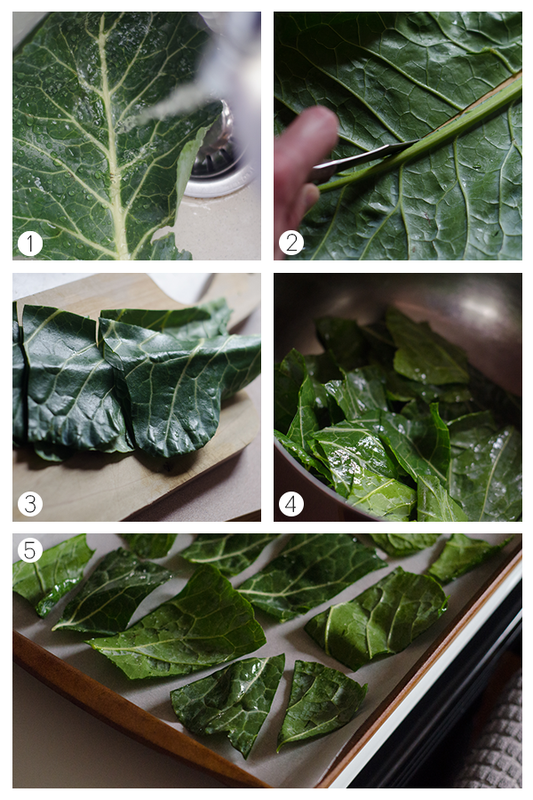 After a bit of searching online collard green chips was something that my mother had stumbled upon as a alternative to kale chips and sent my way. Apparently, kale is out of season right now? 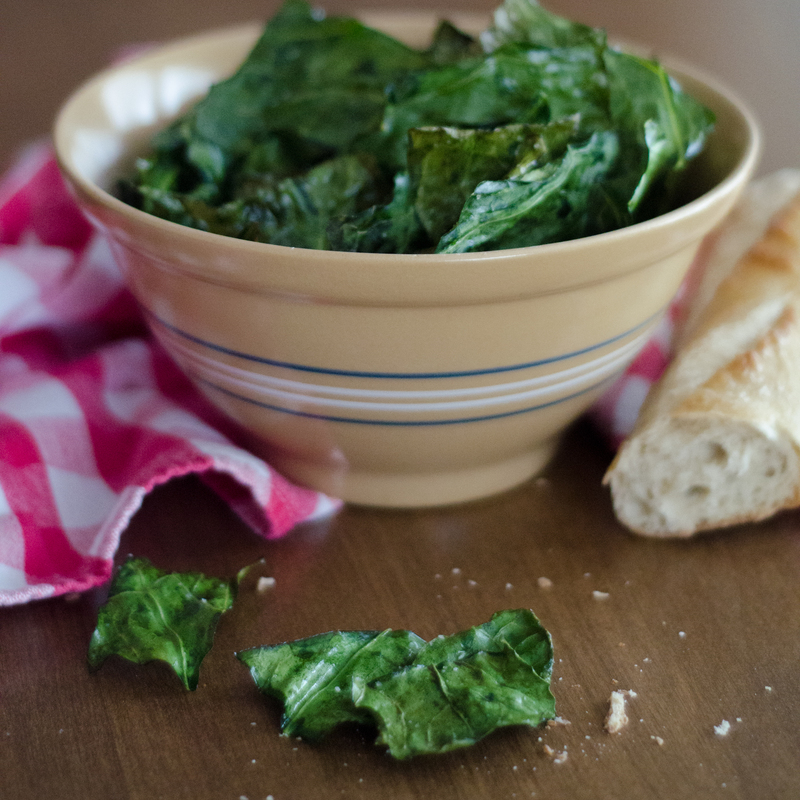 So, collard green chips it was, a healthy substitute for potato chips. Place on a parchment paper lined cookie sheet and bake for 5 minutes. Flip the leaves and bake for another 5 minutes. Don’t let them become yellow or brown, they will yield a bitter after taste. Not yum! Bake until they are just crispy. You will have to keep an eye on them to make sure they don’t yellow so don’t stray too far from the oven. Who doesn’t like apples? And who doesn’t like eclairs? Nobody, of course! From my Introduction to Philosophy classes in college I deduce that everyone must also like Apple Eclairs. Boom, your mind is blown and your mouth is watering. Thanksgiving is right around the corner and Halloween is at the corner we just passed. I can’t believe what time of year it is! This past year has gone by so quickly. I was gone this past year in Ecuador and never got to meet my nephew, who was born only several weeks after I left for work. To be back and see little Judah walking has been pretty incredible. He’s a cutie and just had his birthday party yesterday. 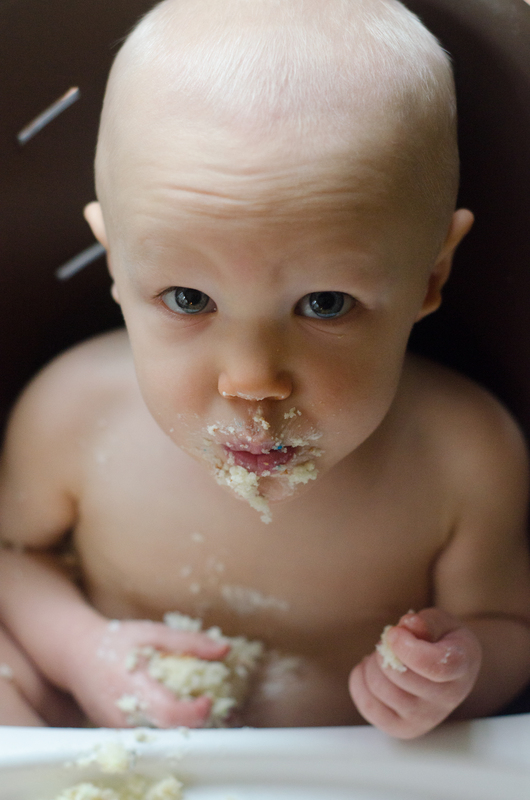 It was a blast to watch him eat his cake. He made such a mess! His older siblings helped him blow out the candles and lick the decorations clean from off his cake -of course they were helpful for sweets! For the birthday party I wanted to make something fall-esque so I made Apple Eclairs, something of an invention when I couldn’t make what I really wanted to make. I used a basic pate a choux. I had tried making this before in Puno, Peru but it’s at 12,000 feet above sea level so it was almost instantly a fail. 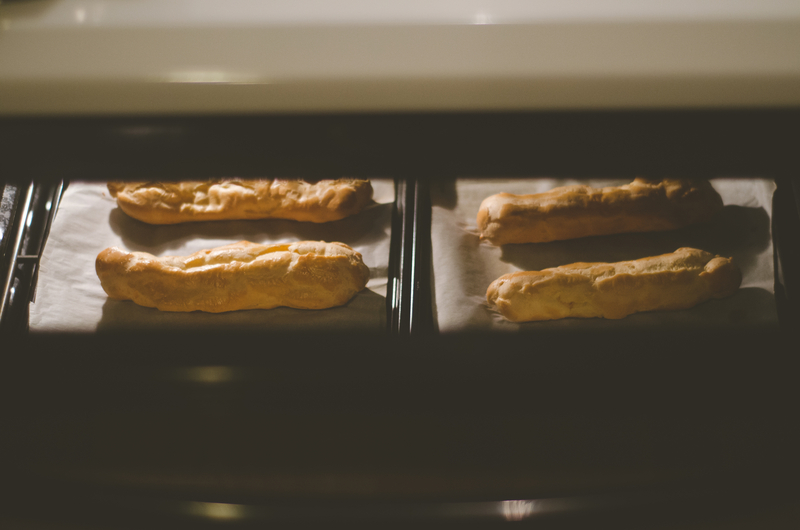 So, for the first time making pate a choux at an acceptable altitude I was stoked watching them rise in the oven. I’m telling you, baking is magic. Julia Childs says that pate a choux is an easy staple that every cook ought to have in their kitchen repertoire. I agree, it is easy –once you understand the ground rules- and there’s a lot you can do with pate a choux, which makes it sure to surprise every time you serve it. I did not use her recipe exactly, but when I read it afterward I wish that I had. Boil water in a 1 1/2 quart heavy bottom pan along with butter, sugar and salt. Boil until butter is melted. While that is going on measure out the flour.Remove from heat and add all the flour to the water at once and beat immediately and vigorously for several seconds until it is well blended. Bring the pan back to the burner and place on moderately high heat and beat for 1-2 minutes until the mixture leaves the sides of the pans and does not stick to the spoon and a film appears on the bottom of the pan. Remove from heat and place in a mixing bowl. Spread out flat and allow to cool for about 5 minutes, but not much longer. If you don’t you will end up cooking your eggs then and there in the dough. Once slightly cooled break in one egg and stir until well incorporated into the dough. Do this one egg at a time; however, for the last egg add it a little at a time as needed to make sure the dough doesn’t become too runny. It should resemble heavy mayonnaise. Prepare your cookie sheets by lining them with parchment paper and set aside. 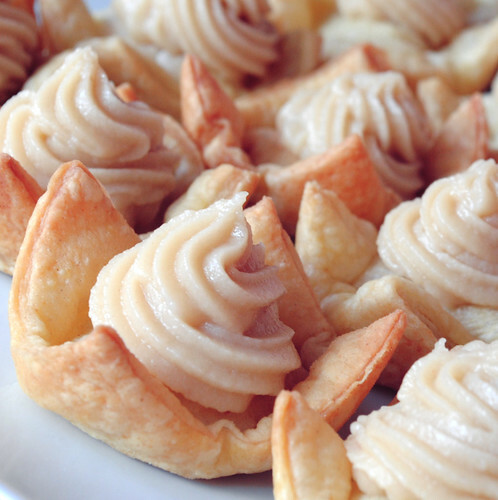 Start to put the pate a choux in your piping bag and put on piping tip. If you do not have a piping bag you can make one out of parchment paper. Fill piping bag and start to pipe your eclairs onto the baking sheets. I made mine about 1 1/2 inch wide and about 6-7 inches long each. Make sure to space by about 2 or more inches as they will puff up quite a bit. Dip pastry brush in beaten egg with a bit of water and smooth over tops of the eclairs. Place the sheets side-by-side in the oven in the upper third portion of your oven. Bake for 20 minutes. They are done when they are doubled in size and are nice and golden and crusty to the touch. Remove from the oven and working quickly pierce the sides with a fork and place back in the oven and let cool with the door slightly open for 10 minutes. Cool the eclairs on cooling racks. I used McIntosh apples, which I just think are great baking apples and they turn into mush so easily, which is needed for this recipe. Peel and core the apples then dice them up and throw them in the sauce pan over medium high heat. Throw in the sugar, butter and cinnamon (I’m not going to lie I didn’t measure the cinnamon I put in, I just threw in what I thought looked and smelled right, adjust as you see fit) and allow to sautee for a few minutes. Turn heat down and let the apple simmer down until they are soft enough to mash. If you like to keep a bit of chunk in your apples at this point that’s fine. Mash with a fork, then add 2 tbsp flour and 1 cup of water and allow to cook for 5 minutes until things are nice and goopy. Remove from heat and allow to cool. Cream together cream cheese, butter and powdered sugar until fluffy and then stir in vanilla. Once the eclairs have cooled used a bread knife to cut them lengthwise in half. I placed that all on the countertop open and spooned out the apple filling into each evenly between them all. At then end if there was left over apple filling I split it evenly between them topping them off. 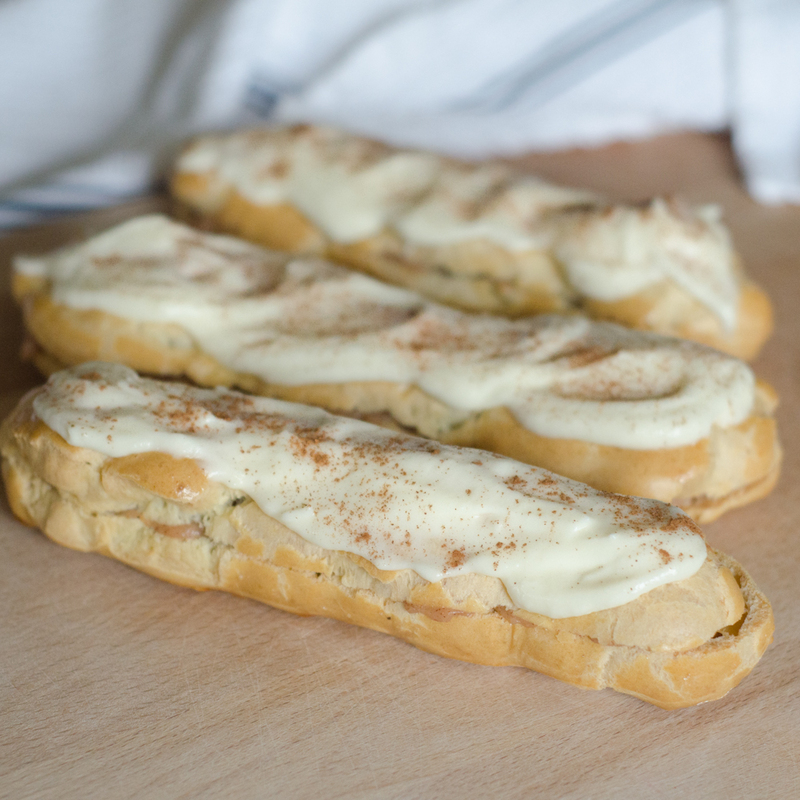 Place the tops back on the eclairs and frost with the cream cheese frosting. 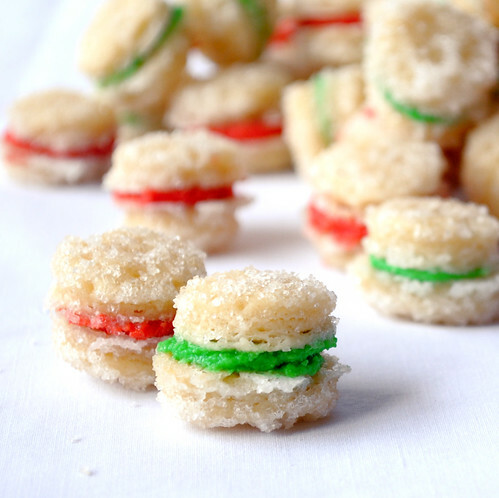 You’ll have extra frosting probably, so find some graham crackers to snack on too! You can powder the tops of the eclairs with a touch of cinnamon to finish up. 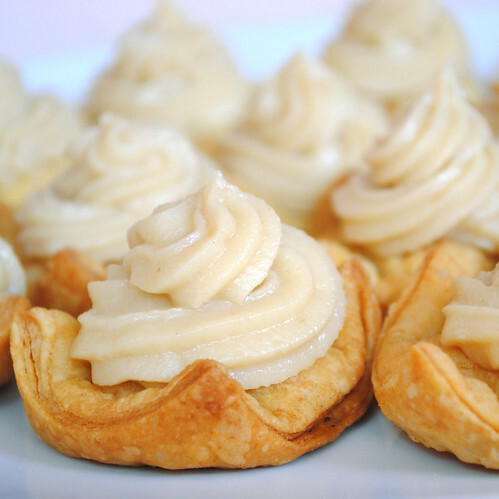 What other kinds of things can you think of to make with pate a choux? Cream puffs is an obvious choice, but what else?! I know! This is the first time I’m posting something that is not for dessert. Before, I wasn’t the one that was preparing my own meals and so it wasn’t quite under my control to capture a portion of our meals and take pretty pictures of them. Now, it is! This recipe is simply delicious. It is simple, but is enough of a unique taste that it impresses. How do you like that idea? You don’t have to work too hard to impress your dinner guests with this soup. But really, I mean what soup is hard to make? They are all generally very easy to make. This has got to be my favorite soup right next to my mother’s chicken noodle soup, which is actually the Amish version of the winter classic. I’ve been thinking about how I would like to do a post about that too. It’s also delicious, and takes a bit more work as you have to make the noodles yourself. It’s worth it. 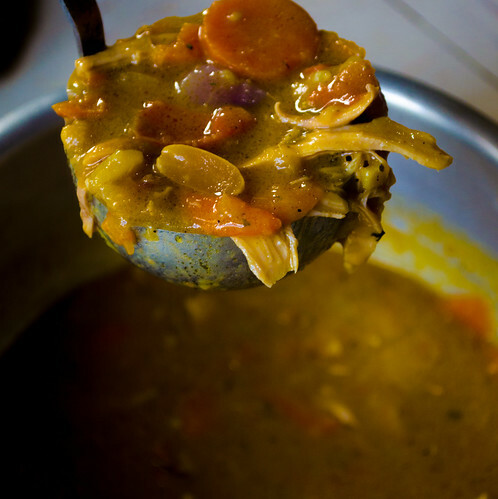 This soup was a staple of ours when we lived in Puno. Amanda was the one who introduced it to me. I am forever thankful! It has been raining a lot here in Quito, Ecuador. This is the rainy season, and it is nearly true to the hour when it starts raining. At one P.M. sharp. Yesterday, I took a nap and woke up to a booming thunderstorm. That’s my favorite thing in the world, but usually I would’ve liked to stay in bed. It was four o’clock so I decided if I had slept anymore I wouldn’t sleep later. 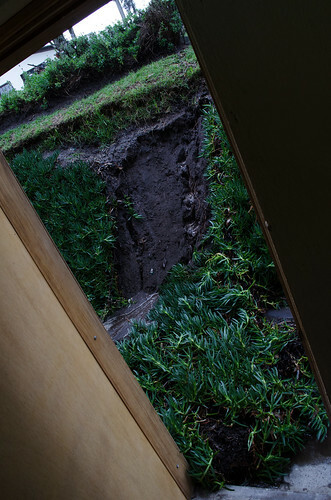 I got up and opened the door and found that there was a landslide outside of my door! I couldn’t believe it! It’s been cleared up since. But, all of this crazy weather has been making me long for all the soups I have in my mind-banks while I huddle up inside my cozy apartment. This soup is sure to chase away any weather blues and remind why winter can be enjoyable. Get your chicken pieces ready and pat them dry and then salt. Heat the vegetable oil over medium heat in a skillet and place chicken pieces within making sure not to crowd your skillet. -I did, but I had no other choice and it still turned out fine- Brown the chicken. While chicken is browning in a large pot and sautée the onion scrapping any brown bits from the bottom of the pan. Sautée until onions are transparent and then throw in the garlic and ginger. If you are confused as to how to peel ginger try this video. 1-2 minutes later add the sweet potatoes and carrots. Add chicken and then broth, crushed tomatoes, peanut butter, peanuts, coriander and cayenne and stir well. Bring to a boil and add salt as needed. I added more water to mine, because I didn’t like the consistency, and then added bouillon for the amount of water I added. 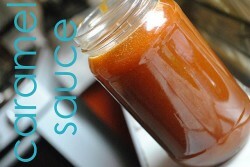 You can also throw in some hot sauce like we did to spice it up. Bring boil down to a simmer and let it go for 90 minutes. Then take the chicken out and let it cool and then strip the bones of the meat and throw that back into the soup. Adjust seasoning if needed and throw in as much pepper as you like. SERVE and enjoy! Somebody said they’d like to see some footage from Ecuador. Here is some you can take a glimpse at. ¡Lo sé! Es la primera vez que estoy poniendo algo que no tiene que ver con el postre. Antes, yo no estaba encargado de preparar mi propia comida para cenar y así que no tenía mucho control para robar una porción de la comida para sacar fotos bonitas de ella. Pero ¡ahora sí! Esta receta es simplemente deliciosa. Es sencilla, pero es suficientemente única -hablando del sabor- que impresiona. ¿Qué te parece eso? No tienes que esforzarte demasiado para impresionar a tus invitados o familia con esta sopa. Pero, de verdad ¿cuál sopa es un desafío hacer? Generalmente, todas son fáciles hacer. Esta receta específicamente me fue introducida por mi amiga. Estoy por eso siempre agradecido! Esta tiene que ser mi sopa favorita aparte de la sope de pollo y fideos que mi mamí hace, cual en realidad es una receta de los Amish y su versión de la clásica sopa del verano. He estado pensando en la posibilidad de hacer una entrada de esa entrada también. 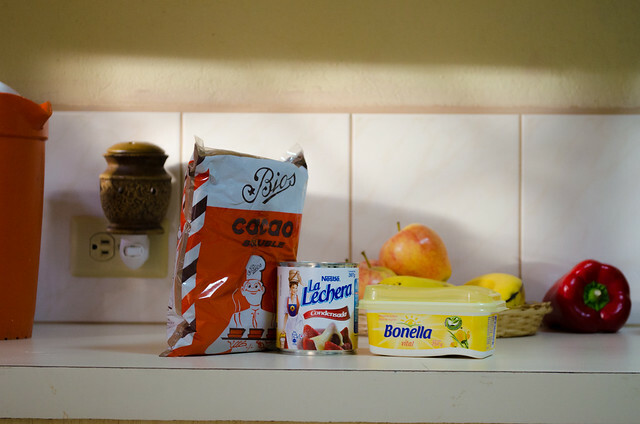 Es muy deliciosa y requiere un poco más de esfuerza porque tienes que hacer los fideos a mano, pero vale toda la pena. Está lloviendo muchísimo aquí en Quit, Ecuador. Es la estación de las lluvias y es por poco a la hora cada día llegando. A la una de la tarde. Ayer, estaba costado durante la tarde y cuando me desperté at las cuatro estaba lloviendo. Me hubiera gustado quedar en cama, pero sí lo hice es probable que no me podría dormir más tarde. Entonces fui a la puerta y la abrí para encontrar que ¡hubo derrumbamiento fuera de mi cuarto! No lo podía creer. Ha sido despejado desde entonces. Pero, toda esta locura con el clima me procura comer toda la sopa que tengo en mis depósitos de recetas mientras que me acurruco dentro de mi departamento acogedor. Esta sopa consta de ahuyentar la depre del clima y hacer recordar porque está estación del verano es tan especial. Toma el pollo y sécalo con algún trapo y luego salarlo. Calienta el aceite sobre fuego medi0-alto en un sartén y coloca los pedazos de pollo adentro para dorarlo. Le receta original dice que no debes abarrotar el sartén, pero yo lo hice de todos modos y no lo afectó nada. Mientras que el pollo dora pon en una olla grande un poco de aceite más y pon la sobre fuego medio-alto y soltar la cebolla, raspando el fondo para quitar que se pegue. Salta la cebolla hasta que se pongan transparentes y luego agrega el ajo y gengibre. Si estás confundido cuanto a como pelar gengibre mira este video. Uno o dos minutos después añade la camote y zanahorias. Agrega el pollo y luego el caldo, los tomates, mantequilla de maní, maní, culantro, cayena y mezcla bien. Hiérvala y añande sal como necesario. Yo añadí un más agua a la mía porque no me gustaba la consistencia, y luego añadí más caldo Maggi y el agua para compensar. También puedes agregar algo de ají para hacerla más picante. Baja el fuego y déjala cocer a fuego lento para 90 minutos. Luego, saca el pollo de la sopa y déjalo enfriar y luego quita de los huesos la carne y reemplazarla a la sopa. Ajusta el sazón si es necesario y luego agrega la cantidad de pimienta que te guste. ¡SIRVE y provecho! Well, well, well. Has it been too long since I’ve put up a new entry? Unfortunately it has! I am looking at the date that my last entry was posted and I am ashamed of myself for letting this blog go so long without any kind of maintenance. The good news is that though I haven’t beent he best blogger there have been nearly 60 people everyday who still visit The Handicapped Kitchen. So, thanks goes out to all you who have been visiting! Truth be told, the last months of my work in Peru were absolutely so jam-packed it was ridiculous to even think about mustering up something in the kitchen and then set up studio to take pictures. To update you on where I am at, I have recently moved from Puno, Peru to Quito, Ecuador and am now living at only about 9,000 feet above sea level! It doesn’t matter much, the air is still thin and anything beyond a brisk walk turns into my lungs becoming coughed out onto the sidewalk. But, Ecuador is a beautiful country, so that makes up for it! As for the dessert, I wanted to share with you all this very popular Brasilian dessert. It is called brigadeiro (pronouned bree-gah-day-roo). 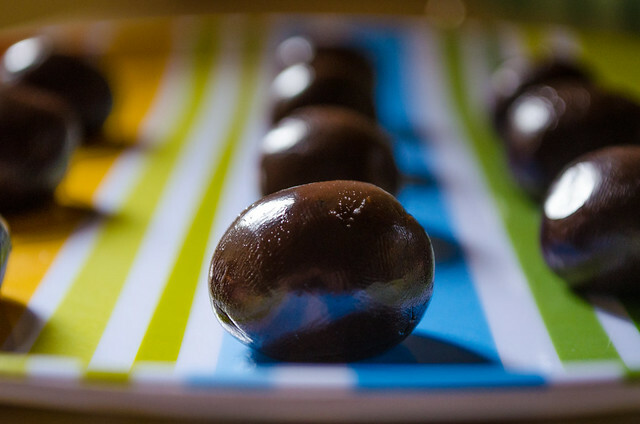 They are little balls of chocolate that taste something like tootsie rolls, but much more delicious. And they are simply easy to make! Put all the ingredients in a medium sauce pan and mix together. Put over medium heat and stir constantly. Yea, there is a reason that is bold and italicized. It is very important. You are working with milk here, and if you burn it… yuck! I made a video for this post specifically because it is hard to explain the consistency this dessert should have when the dough is ready to be taken off the heat. The video is at the bottom of this post. You will cook this dough over medium heat and stir constantly for about 10 minutes. It will begin to boil within the first few minutes and will thicken gradually. You will see in the video that you want to take the dough off the heat when the dough seems to sit in the middle of the bottom of the pan in a mass and seems to pull away from the sides of the pan. It will seem like a big blob. Remove the pan from the heat and with a spatula scrap it out into another heat-proof bowl and let it cool. I let mine cool for a little over an hour. Then, grease your hands with butter or something of the kind -especially your fingertips- and pul out the dough a piece at a time and roll into balls. Place them on a tray. At this point, if you decide to, you can roll them in crushed nuts or powdered sugar or cocoa powder. They really make for cute little desserts. When they are all rolled into little balls put them in the fridge over night. Serve chilled. Bueeeeeno, ¿hace mucho tiempo que no escribo una nueva entrada? Desafortunadamente, la respuesta es un gran ¡SÍ! Estoy mirando la fecha de la entrada anterior y me da vergüenza por dejar a este blog tanto tiempo sin ningún tipo de mantenimiento. La buena nueva es que aunque yo no he sido lo mejor de los blogueros hay muchos de ustedes que cada día están visitando a The Handicapped Kitchen a pesar de mi negligencia. Diario tengo casi 60 visitas. Entonces, toda mi gratitud les mando a ustedes que son más fieles que yo. Para decir la verdad, los últimos meses de mi trabajo en Perú eran absolutamente demasiado atiborrados de eventos y la preparación para salir y fue agotador para pensar aún en la posibilidad de pasar un día en la cocina ni que hablar de sacar fotos de la comida. Para ponerles al corriente de mi vida y donde estoy, recién me he mudado desde Puno, Perú a Quito, Ecuador y ahora vivo a ¡2,800 metros sobre el nivel del mar! No importa tanto, pues, porque el aire sigue siendo menos rico de oxígeno y algo más que dar pasos ligeros hace que mis pulmones quieran voltearse de mi cuerpo al suelo. Pero, Ecuador es un país hermoso, ¡así que lo compensa! En cuanto al postre, o quiero compartir con ustedes este postre brasileño muy popular. Se llama brigadeiro. Son bolitas de chocolate que se asemejan a un dulce americano Tootsie Rolls, pero mucho más delicioso. Y, que más que ¡son fáciles hacer! Pon todos los ingredientes en una olla de tamaño medio y mezcla. Ponlo sobre medio fuego y revuelva constantemente. Sí, pues, hay una razòn porque he puesto esa palabra en letra negra y cursiva. Es muy importante. Estás tratando con leche, pues, y si lo quemes… ¡qué asco! Hice un video para esta entrada específicamente porque es difícil explicar como debe parecer la consistencia de este postre cuando está listo remover del fuego. El video está aquí al fondo de esta entrada. Lo cocinarás sobre medio fuego y lo revolverás continuamente por uno 10 minutos. Empezará hervir entres los primeros minutos -no desvies la mirada ni dejes de revolverlo- se va a hacer más espeso gráduamente. Ve el video -que también está en español- para ver la consistencia. Something that we face daily while working in Puno, is trying to throw water on smoldering superstitions. It’s a hard line to define whether we should confront them or not because sometimes they are just silly/quirky beliefs and aren’t necessarily satanic in nature. We had to confront a belief yesterday that had me literally flabbergasted! 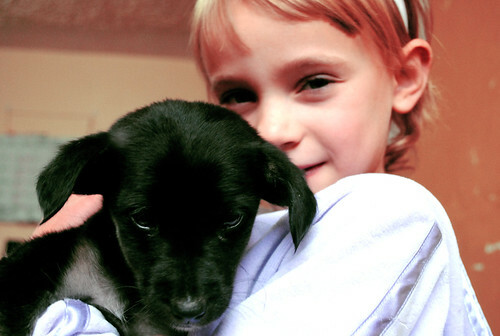 This is Ella with Jesse, the new addition to this household for now. One of our contacts is in pain and it’s believed that if you get a black puppy or bunny and put it next to where the pain is it will absorb the pain. However, it only lasts for one day, and you need to kill it to get rid of the pain. We went to see this contact the other day and she had a puppy on the bed and she told us her grandmother was going to kill it for the latter reason. She told us we should take it home or she would die!!!! So, she’s here for now, but we don’t know if she’s going to stay with us or if we will find another home for her. Poor little thing, she’s got diarrhea and she is really malnourished. Her back legs are pathetic and she has very little appetite. Anyone got any suggestions? On to a lighter topic, I finally made a dessert that is worth putting up. Last week I made a custard and it turned out awful! Even the neighbor’s dog wouldn’t eat it. But, according to my friend Garren, this is the best thing I’ve made yet! You have two routes you can take in embarking upon this recipe. You have an easy route, and the route not for those light of heart in the kitchen. You know, this kitchen is called handicapped for many reasons, one such reason would be the limitation of things I can buy in my local supermarket. 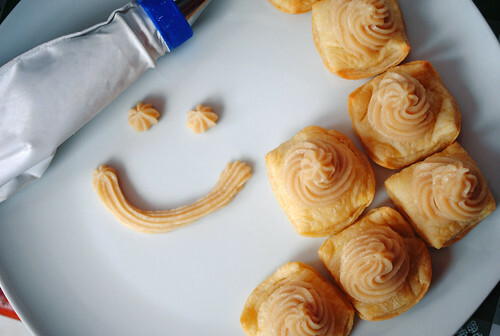 To make these tasty sensations, I had to make my own puff pastry by hand. This is the second time I’ve tried my hand at puff pastry, and the second time round it’s really not that bad. It takes three days to make, sure! But, it’s not strenuous work. If you are up for a challenge, I would say give it a go! My best advice if you are making this homemade is to go here. It will tell you everything you need to know… except that instead of using butter, I had better results with margarine, it has to do with the melting temperature of butter and margarine. Or you could just go to your local supermarket and buy some filo dough… cheater! 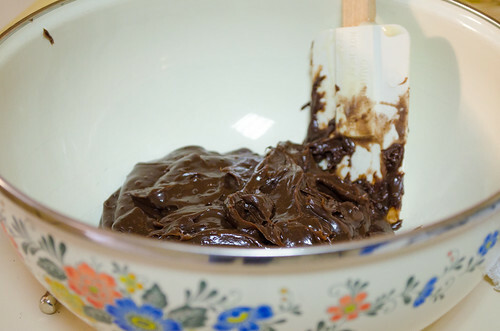 In a medium sauce pan whisk together flour, sugar, and salt. 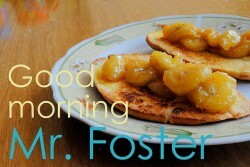 Then whisk in melted butter and eggs until it is well mixed. Pour in the milk gradually and whisk as not to create any lumps. Put over medium high heat and stir constantly bringing the mixture to a boil. Once it begins to boil it will thicken to a custardy goop. Remove the pan from the heat and mix in the vanilla. Set aside to cool. Preheat the oven to 350 degrees. Grease a muffin pan. Roll out the dough until it’s rather thin. About as thin as poster board, I suppose. Cut the dough into 3″x3″ squares and place the squares into the muffin pan lining the bottom and allowing the corners to peak up the sides of each cup. Put in the oven and bake for 15-20 minutes or until golden brown. Remove from the oven and slide out of the muffin pan. Put the cream in a piping bag and pipe into the centers of the pastries when they are cooled. Youins up in Ohio, I hear, are getting quite a bit of snow! How cold is it where you’re at? I’m glad for you guys in Ohio though, with all your snow, even though I’m sure the majority of you are wishing to blow-torch all the neighborhood snowmen for a winter genocide. Interesting piece of random etymology, because I’m that dork, genocide was coined in 1944 in reference to the Haulocaust. Genos is greek for “race, kind” and –cide is latin for “cutter, killer, slayer.” Try to think of all the words you know that end in -cide like, suicide (L sui– “of oneself”) homicide (L homo– “man”), felicide (L feli- “cat”), or even canicide (L cani- “dog”). So interesting! But, highly morbid too, so let’s talk about food. That’s right! 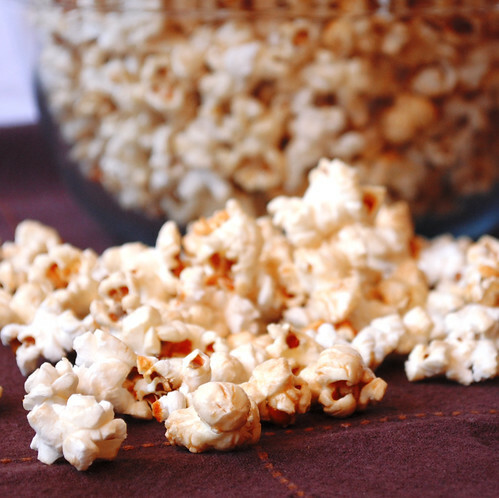 Homemade kettle corn. Usually, things that are made at home are a lot healthier. That’s not the case here. 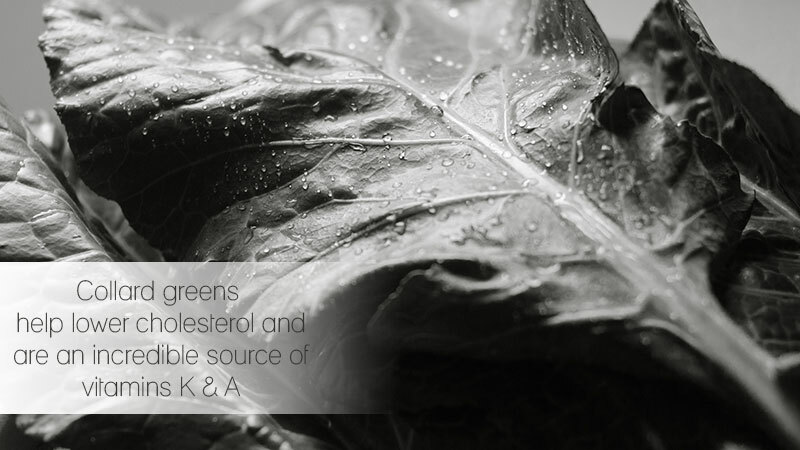 It may not have preservatives, but it’s certainly no diabetic’s best friend. Put the oil in a large pot and put it over medium heat. Put two popcorn kernels in the oil. Cover. When they both pop you’ll know your oil is ready for the rest of the popcorn. 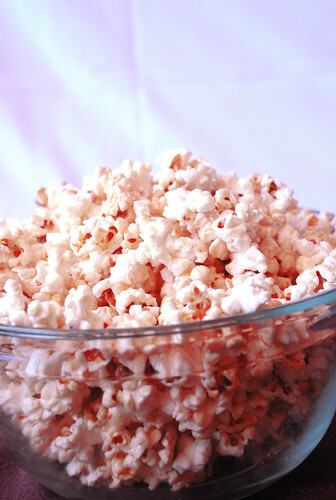 In a mixing bowl measure out the popcorn and sugar and vanilla, mix together. When the two popcorn kernels pop, dump in the sugar, vanilla popcorn mix. You will want to keep the pan moving or your sugar may burn and stick to the bottom, believe me, you don’t want this to happen. If you’re thinking I’m speaking from experience… you get a gold star. Keep the pot moving. Remove from heat when the popping slows to 2 or 3 per second. When off heat continue to move until popping completely stops. Put the popcorn immediately into a popcorn bowl. Don’t taste it yet, it is extremely hot. Delicious! You may have to fool around with the heat and what-not to make it work best for you. Give it a try! A Very Merry Christmas to all my readers! For two days I am planning on doing absolutely, 100% NADA! It’s going to be amazing, and it’s going to go super fast too, which is too bad. Good news about being at 12,000 feet is that it’s nice and cold and gives the atmosphere, at least, that it’s Christmas! It felt good to sleep in as late as I did today (only 10 am), and now I’m sitting on the couch with my buddy Thomas as he plays with his NEW ARMY MEN! Woooo! He’s 4. And he’s wearing a Spiderman Costume. It’s perfect. Yesterday, my day was spent under insurmountable stress. Now, I wasn’t making the whole dinner, but I was making cookies, buns for dinner, and puff pastry (by scratch mind you) and also had to wrap presents and finish making the stockings! I had the help of a faithful friend, Leon, who thank-goodness toughed out my Monica-like controlling behavior in the kitchen. If you’ve watched Friends, you know what I mean. One of my greatest Christmas gifts was that everything came out of the oven looking just as it should! Nothing fell flat, nothing tasted odd, nothing was short of perfect! 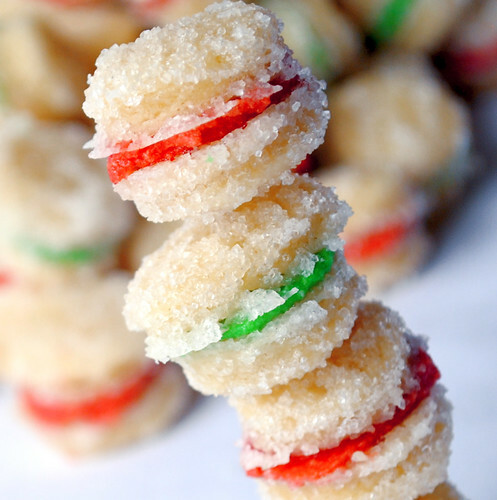 These are my all-time favorite Christmas cookie. They came to be known my my mouth by my sister’s sister-in-law. Every year my sister hosts a Christmas Cookie Exchange and these were in said exchange. So, when I got my hands on the name of these babies I was exstatic. However, the recipe was not that easy to find online by the name. I hope that people looking for these can find them easier via… here! Put the flour in a mixing bowl and cut in the butter. It can be pretty coarsely cut, it doesn’t have to be extremely fine. Then, mix in the heavy cream. It’s so very little for the amount of dry ingredients that there is, or so it appears, but the butter will tie everything together, and you’ll be very surprised. Put the dough in the fridge for an hour. Preheat the oven to 375 degrees F as you pull the dough out of the fridge from it’s hour chilling time. Lightly flour your countertop and roll your dough out to 1/8″ thickness. Cut into 1 1/2″ rounds or… whatever size you want really! I used an honest-to-goodness old pill bottle to cut out the rounds. Put the granulated sugar into bowl or on a plate and coat the rounds on each size so they are covered in sugar. I had to use a little bit of water on my finger to wet each round on each side to make sure the sugar would stick. Then, place on a cookie sheet. You can put them relatively close together, because they won’t spread out. Bake for 7 to 9 minutes or until slightly puffed. Let cool and then remove from the cookie sheet. Once fully cool, make sandwiches with the filling. 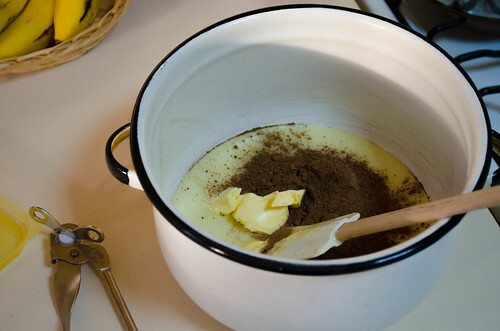 Put the powdered sugar into a mixing bowl and cream together with the butter. Then add the yolk and vanilla. You can add food coloring if you like! Update: Yes, this recipe calls for raw egg yolk. Yes, there is risk of salmonella consuming raw egg. Yes, I personally take the risk every time because this frosting is worth dying for. But, in all seriousness, if using raw egg makes you take pause, you have a few options. You can either buy eggs that specifically say they are pasteurized, you can pasteurize your own eggs, or you can sub out the yolk for 1-1.5 tbsp heavy cream. That’s it! 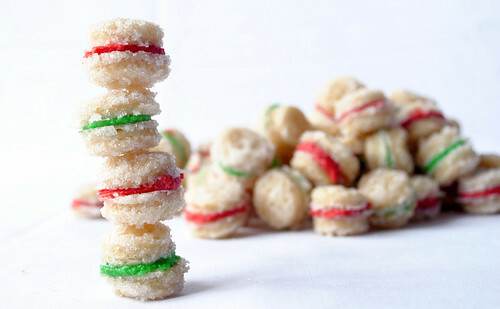 I know it’s a little late for you to make these for your annual Cookie Exchange but, maybe you can make them for New Years. They are so delicious you will not regret it. How are you passing your Christmas? And what are you doing for New Years?